Porcupines are rodents with a coat of sharp spines, or quills, that protect them against predators. The term covers two families of animals, the Old World porcupines and New World porcupines. Both families belong to the Hystricognathi branch of the vast order Rodentia, both display similar coats of quills, but they still are quite different and are not closely related. Porcupines occupy a short range of habitats in tropical and temperate parts of Asia, Southern Europe, Africa, and North and South America. Porcupines live in forests, deserts, rocky outcrops and hillsides. Some New World porcupines live in trees, but Old World porcupines stay on the rocks. Porcupines can be found on rocky areas up to 12,100 feet high. Porcupines are the third largest of the rodents, behind the capybara and the beaver. Most porcupines are about 25 to 36 inches long, with an 8 to 10 inch long tail. Weighing 12 to 35 lb, they are rounded, large and slow. Porcupines come in various shades of brown, gray, and the unusual white. Porcupines' spiny protection resembles that of the unrelated hedgehogs and Australian spiny anteaters. Quills come in varying lengths and colors, depending on the animal's age and species. Porcupines' quills, or spines, take on various forms, but all are modified hairs coated with thick plates of keratin, and embedded in the skin musculature. 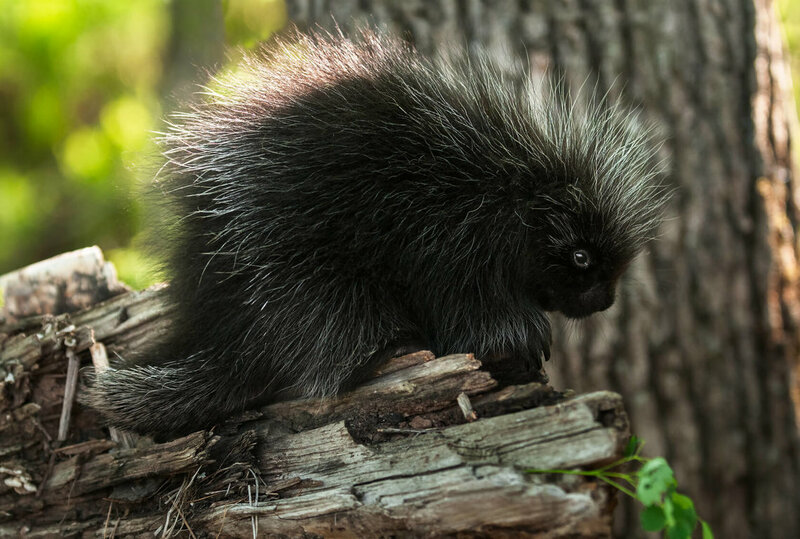 Old World porcupines have quills embedded in clusters, whereas in New World porcupines, single quills are interspersed with bristles, underfur and hair. Quills are released by contact with them or may drop out when the porcupine shakes its body. New quills grow to replace lost ones. Porcupines have a relatively high longevity and had held the record for being the longest-living rodent, until it was recently broken by the naked mole-rat. The New World porcupines are indigenous to North America and northern South America. They live in wooded areas and can climb on trees, where some species spend their entire lives. They are less strictly nocturnal than their Old World relatives, and generally smaller. In taxonomic terms they form the family of the Erethizontidae. The two subfamilies of New World porcupines are mostly smaller than Old World porcupines, have their quills attached singly rather than grouped in clusters, and are excellent climbers. The New World porcupines are more closely related to several other families of rodent than they are to the Old World porcupines. New World porcupines are stout animals, with blunt, rounded heads, fleshy, mobile snouts, and coats of thick, cylindrical or flattened spines ("quills"). The spines are mixed with long, soft hairs. They vary in size from the relatively small prehensile-tailed porcupines, which are around 12 inches long, and weigh about 32 oz, to the much larger North American porcupine, which has a body length of 34 inches, and weighs up to 40 lb. They are distinguished from the Old World porcupines in that they have rooted molars, complete collar bones, entire upper lips, no trace of first front toes, and four teats. Their long and powerful prehensile tails help them balance when they are in the tree tops. Their diets consist mainly of bark, leaves, and conifer needles, but can also include roots, stems, berries, fruits, seeds, nuts, grasses, and flowers. Some species also eat insects and small reptiles. Solitary offspring (or, rarely, twins) are born after a gestation period of up to 210 days, depending on the species. The young are born fully developed, with open eyes, and are able to climb trees within a few days of birth. The Old World porcupines live in southern Europe, Asia, and most of Africa. They are large, terrestrial, and strictly nocturnal. In taxonomic terms they form the family of the Hystricidae. The eleven Old World porcupines tend to be fairly big, and have spikes that are grouped in clusters. Old World porcupines are stout, heavily built animals, with blunt, rounded heads, fleshy, mobile snouts, and coats of thick cylindrical or flattened spines, which form the whole covering of their bodies and are not intermingled with ordinary hairs. The habits of most species are strictly terrestrial. They vary in size from the relatively small long–tailed porcupine with body lengths of 11 to 18.9 inches, and a weight of 3.3 to 5.1 lb, to the much larger crested porcupines, which are 24 to 33 inches long, discounting the tail, and weigh from 29 to 60 lb. The various species are typically herbivorous, eating fruit, roots, and bulbs. Some species also gnaw on dry bones, perhaps as a source of calcium. Like other rodents, they have powerful gnawing incisors, and no canine teeth. One or two (or, rarely, three) young are born after a gestation period between 90 and 112 days, depending on the species. Females typically give birth only once a year, in a grass-lined underground chamber within a burrow system. The young are born more or less fully developed, and the spines, which are initially soft, harden within a few hours of birth. Although they begin to take solid food within two weeks, they are not fully weaned until 13 to 19 weeks after birth. The young remain with the colony until they reach sexual maturity at around two years of age, and share the burrow system with their parents and siblings from other litters. Males, in particular, help defend the colony from intruders, although both sexes are aggressive towards unrelated porcupines. Old World porcupines are also characterized by imperfectly rooted cheek-teeth, imperfect collar-bones, cleft upper lips, rudimentary first front-toes, smooth soles, six teats arranged on the side of the body, and many cranial characters. Porcupines are only occasionally eaten in western culture, but are very popular in Southeast Asia, particularly Vietnam, where the prominent use of them as a food source has contributed to significant declines in their populations. Kenya porcupines are eaten as a delicacy. Overhunting has been cited as the porcupine's greatest threat. They are also commercially farmed. Porcupine quills have long been harvested for clothing, musical instruments, containers and accessories. When porcupine populations are near cultivated areas, they can become viewed as “agricultural pests”. They are smoked out of their burrows and hunted with spears, nets, or dogs. These practices have eliminated them from densely settled areas.